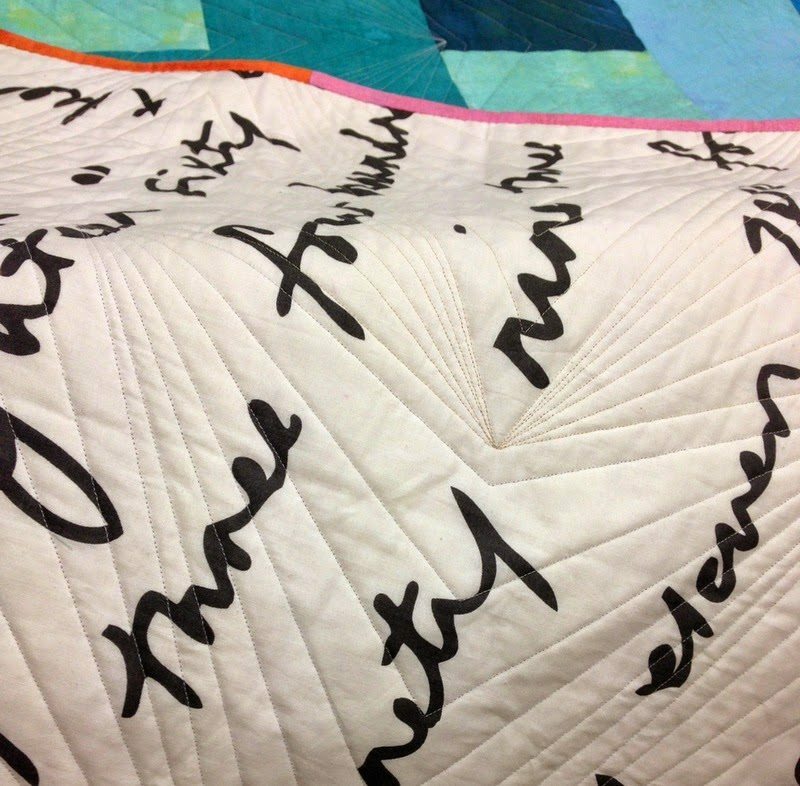 Thank you FQS for inviting me to make the FQ Fizz quilt. There are so many great projects happening at the Fat Quarter Shop and I am always excited to be a part of the fun. Fat Quarter Fizz is a free pattern by Fat Quarter Shop. As the name implies, it is Fat Quarter friendly and the pattern has instructions for Crib, Lap (small and late), twin, Queen and King Size quilts. The cleverness of this pattern is the placement of the light and dark fabrics to create a cascading effect. The pattern is easy, quick and can be made with a multitude of FQ combinations. 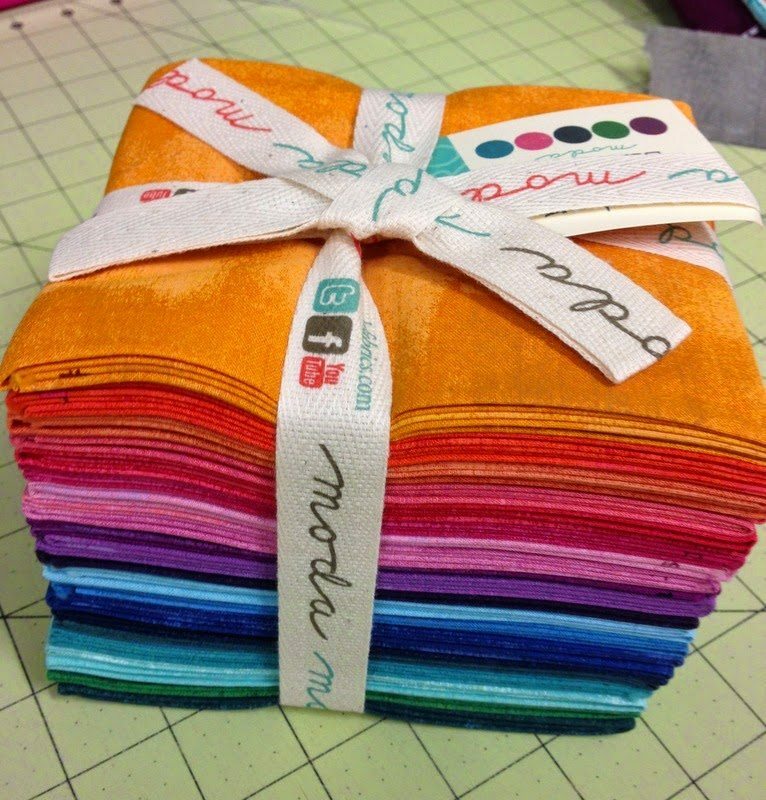 I have made the large twin which finishes at 60 1/2″ x 72 1/2″ with 20 FQ’s from the Basic Grey, Basic Grunge bundle from Moda. I just love the texture of the Grunge fabrics and the selected colours in this bundle are like a heavenly rainbow. To prove how quick the quilt is to make, I started at 10am one morning and finished quilting it by 11pm that night ( with 1 million interruptions in between ). The binding I did the next evening. The multi-coloured binding was made by joining all the left over bits of the FQs. FQ Fizz was quilted with Aurifil 2600 50wt cotton using a geometric pattern by Karlee Porter. The light, silvery grey thread beautifully melts into the colourful grunge fabrics. Backed in my favourite IKEA print. 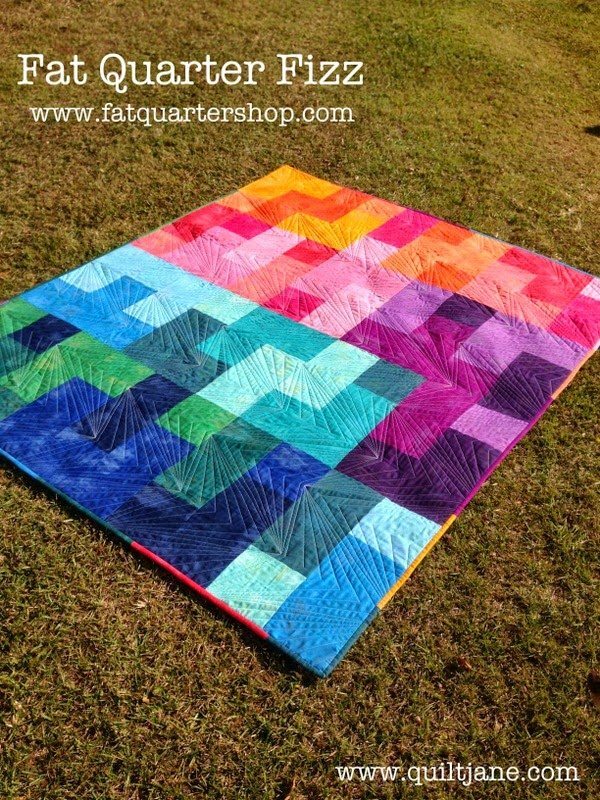 Read the Jolly Jabber today to see the blue and white version of the quilt and links to other bloggers and their fabulous take on FQ Fizz. and the link to the accompanying video tutorial can be found at http://youtu.be/6bNFkjKJKrU. Gorgeous! I love the fabrics you chose, Jane! love your version Jane…. it's a very happy quilt and the quilting is perfect… have just ordered some of that thread to try…. and I think I need a trip to Ikea? 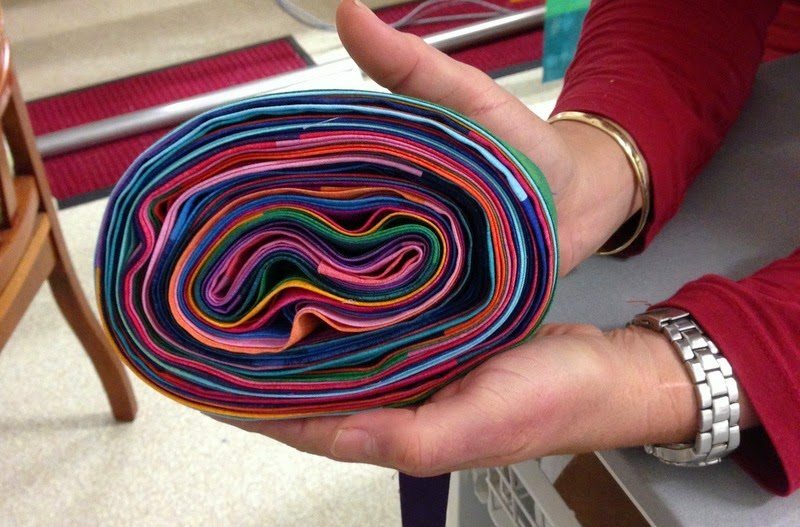 Your rainbow fabrics made a beautiful quilt! This is one of my favorite versions. Love looks of almost solid prints. beautiful! Amazing Jane, you're a machine!! Love the quilt design, it fits the colours to a tee. Gorgeous! I love your quilting on this!! 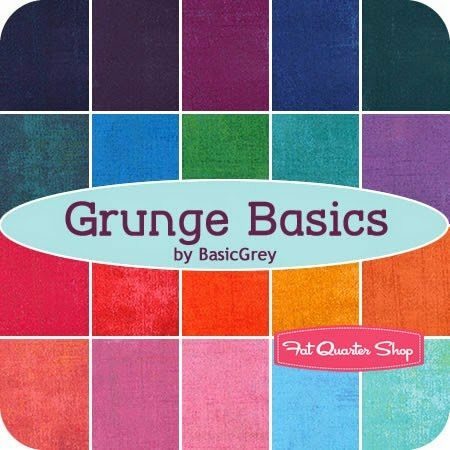 I love the dimension the grunge adds to it! 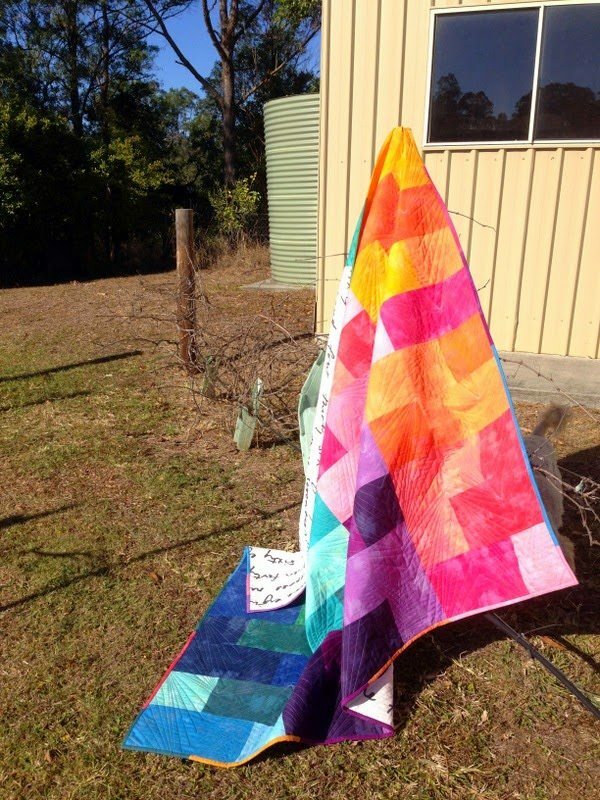 great quilt and you have done it soooo quickly, another one to add to the to do list. Wow! I love your version of this pattern… It really fizzles!! I can't believe that you put it together in a day… That is encouraging and inspiring!!! Love it. My favourite of all the ones I have seen so far. What a beautiful quilt! Great job! wow so quick – love the grunge fabrics you used and the quilting design is perfect ! 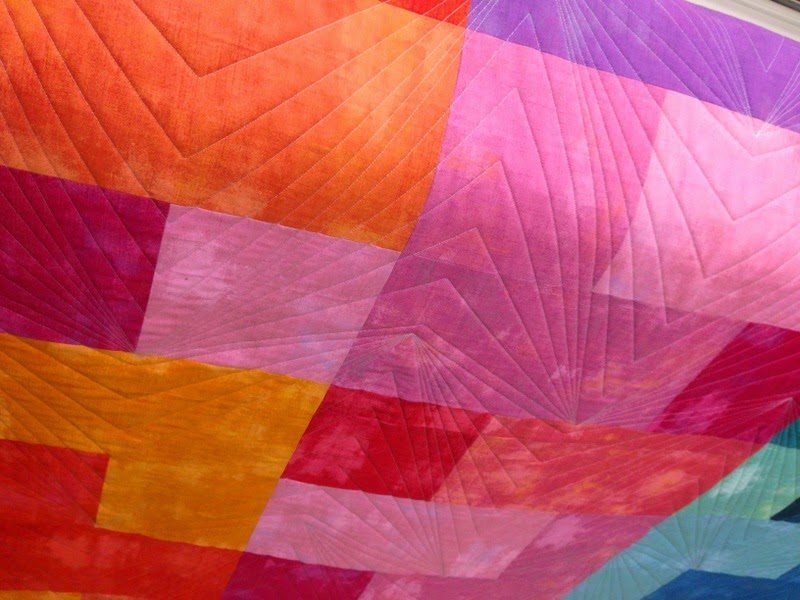 The impact of all those brilliant solids is spectacular in your quilt! Am pinning this to my to-do list – what a cool pattern and you have done a beautiful job of it! I'm seeing these all over the web. I love your rainbow version. Oh wow! I love how you quilted this (is this the correct term?! I'm new to sewing) I'm not even sure how to describe it – like elongated Star Trek symbol – whatever it's called it's amazing! Really makes the quilt pop for me!